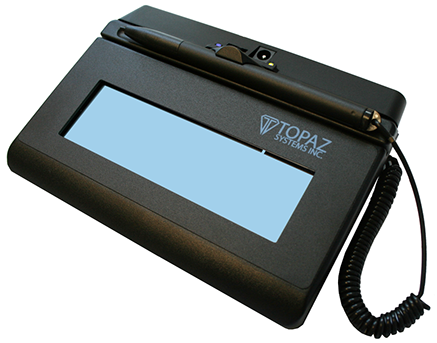 SigLite® LCD BT 1×5 has all the benefits of Topaz electronic signatures plus the additional feature of wireless capability through Bluetooth. Like the SigLite LCD 1×5, the SigLite LCD BT 1×5 is Topaz’s low-cost pressure-sensitive electronic signature pad with a backlit transflective LCD that displays “electronic ink” under the pen tip during signing. SigLite LCD BT 1×5 features all the high-quality biometric and forensic capture techniques of a SignatureGem LCD tablet but with a low-cost touchpad and stylus in place of the more rugged digitizing pen and inert tempered glass surface of the SignatureGem tablet series.